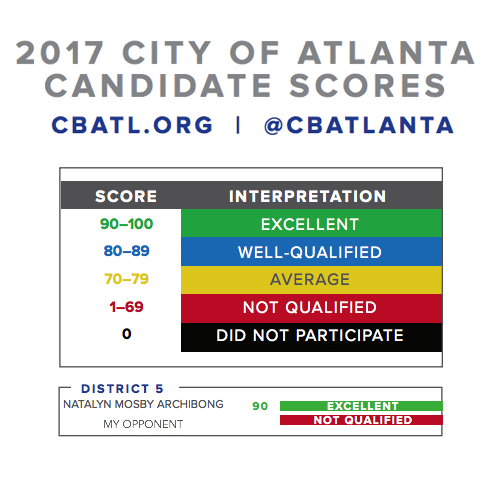 The Committee for a Better Atlanta (CBA) issued scores for all of the City of Atlanta races. The CBA found, after interviewing both District 5 candidates, that Natalyn Mosby Archibong is the only qualified candidate in the District 5 race. Candidate scores are based on written questionnaires and in-person interviews, covering topics including: public safety, financial competence, ethics/transparency, transportation, affordable housing and arts, among others. CBA does not endorse any candidates. The Committee for a Better Atlanta (CBA) is a nonpartisan business coalition that has been scoring candidates running for mayor, city council, and Fulton County Commission for decades.